From the McDonalds in Whitesburg, head south on US 119 for 4 miles to the top of Pine Mountain. Start down the mountain, and in the middle of a left-hand curve you will see the driveway for Wileys (with pink famingoes) on your left. Park in the big gravel lot on the side of the highway. 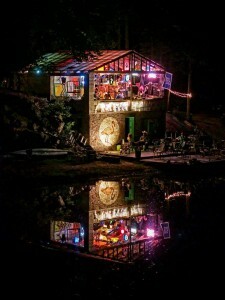 2014 will be the 10th Annual Mountain Justice Summer Camp and we are excited to announce that we will be back on beautiful Pine Mountain in Kentucky at the wonderful and wacky place called Wileys Last Resort. Pine Mountain (elev. 2900 ft) is one of the most beautiful and biologically diverse mountains in Appalachia, and it has numerous hiking trails, mountain views, wateralls, rare and endangered plant species, black bears and gorgeous forests. The mountain laurel will be in bloom during our camp and there is an abundance of wildflowers on the mountain. Our Mountain Justice Summer camp will feature nine days of workshops, trainings, learning about coal mining and mountaintop removal and Appalachian history and culture. Our Summer Camp site overlooks a huge mountaintop removal mine on nearby Black Mountain.